Florence-Carlton players, including seniors Makenna Liles (31) and Danielle Zahn (third from right), celebrate during their 59-37 Class B state semifinal win over Forsyth on Friday in Belgrade. Florence’s Danielle Zahn attempts a layup as Forsyth's Jordan Cookman (23) and Haley Vance (10) defend during Friday's Class B state semifinal game in Belgrade. Columbus’s Payton West tries to shoot around Wolf Point's Mary Bighorn (left) and Imani Bighorn in their Class B state semifinal game Friday, March 8, in Belgrade. BELGRADE — If Florence-Carlton senior Danielle Zahn takes an ill-advised shot or makes a sloppy pass, coach Duane Zeiler will often bench her for 30 seconds. Zeiler sat Zahn for several minutes on Friday, but he wasn’t punishing his star guard. Zahn fueled the Falcons to such a big lead, she and the other starters were replaced by the backups in the fourth quarter. 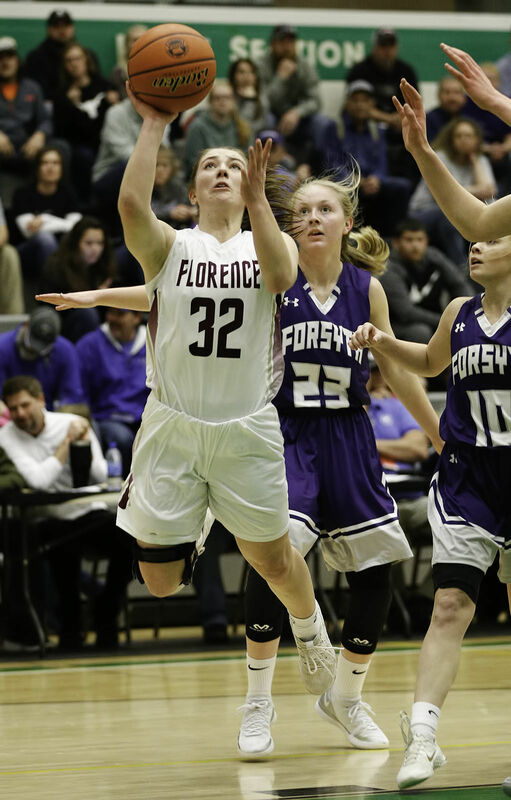 Zahn scored 27 points and dished out seven assists in Florence-Carlton’s 59-37 win over Forsyth in the Class B state girls basketball tournament semifinals. The Falcons, ranked No. 7 in the 406mtsports.com poll, advanced to the state title game for the first time since 1998. “Five years ago when we started, everyone kind of laughed at us because we started out with a three- or four-win season,” Zeiler said. “It was tough, but we’ve slowly been chipping away at it. The first half hardly foreshadowed garbage time. No. 6 Forsyth led 14-13 after one quarter (it led 14-8 at one point), and the score was tied 20-20 at halftime. Florence-Carlton senior Makenna Liles said her team wasn’t worried. Sure enough, the Falcons opened the second half on an 8-0 run. The Dogies responded with a 6-0 run, but Florence-Carlton outscored them 10-1 the rest of the quarter. Zahn keyed the big 18-7 quarter and continued to sizzle in the fourth. The Montana State Billings signee scored 21 points in the second half and shot 11-of-15 from the field (5-of-6 from 3-point range) overall. The Falcons outscored the Dogies 21-10 in the final quarter. Liles added 12 points, and fellow senior Rilee Mangun scored 14. Sophomore Lindsey Hein led Forsyth (21-4) with 17 points and six rebounds, and junior Jordan Cookman scored 10 points. The Dogies will play Missoula Loyola at 9:30 a.m. Saturday in a loser-out game. Florence-Carlton (21-2) has won 20 straight games after losing to Belt and Malta in early December. The Falcons will face Wolf Point at 7:30 p.m. Saturday, hoping to earn their second state championship in as many tries (they beat Frenchtown 45-37 in 1998). For a team that missed state last year and hadn’t reached the title game this century, Florence-Carlton is thrilled to be in this position. Alexa Riveland sunk a 3-pointer early in the first quarter, cutting Wolf Point’s lead to 7-5 and giving Columbus some hope. The top-ranked Wolves promptly went on a 12-0 run, and that was that. Wolf Point overpowered and outshot No. 5 Columbus throughout Friday’s semifinal game to reach its first state championship game in 15 years. “We came out strong, ready, knowing we were going to dominate,” said Wolf Point junior guard Mya Fourstar. Riveland beat the first-quarter buzzer with another 3 to end Wolf Point’s run and cut Columbus’ deficit to 19-8. That shot, too, provided false hope. The Wolves outscored the Cougars 16-6 in the second quarter and 15-6 in the third. Columbus’ tallest player is 5-foot-11 sophomore Brooklyn Wyllie. Wolf Point has three starters who are 6-foot or taller, and that doesn’t include college prospect Fourstar (5-foot-8). Wolves’ 6-foot-3 senior Imani Bighorn would be a defense destroyer even without her tall, athletic teammates drawing attention. Bighorn abused the Cougars, finishing with a game-high 24 points and 10 rebounds. Fourstar finished with 17 points and six assists, and Imani’s twin sister Mary Bighorn — who will play volleyball for Haskell Indian Nations University in Kansas — added 14 points (Imani transferred from Poplar and Fourstar from Frazer before the season). As a team, Wolf Point shot 50 percent from the field and 57.1 percent from 3 (20.9 and 25 percent, respectively, for Columbus). The @WPHS_Wolves lead Columbus 7-5 with 4:23 left in the 1Q. Columbus (21-5) will face defending state champion Three Forks at 11 a.m. Saturday in a loser-out game. Wolf Point’s last state title appearance, in 2004, ended in a 54-52 loss to Townsend. The Wolves hope Saturday’s game ends like 2003’s, when they earned their second championship in school history. Missoula Loyola neither rolled nor coasted, but Friday’s wild ride resulted in an extra day of basketball for the Breakers. No. 9 Missoula Loyola trailed Fairfield early, rallied back, built a big lead and surrendered it. The Breakers needed overtime to win its Class B state girls basketball tournament loser-out game. Fairfield led 9-3 late in the first quarter, but Missoula Loyola went on an 11-1 run to pull ahead in the second. The Breakers trailed 20-19 at halftime but outscored the Eagles 19-7 in the third quarter. The 11-point lead was not safe, as Fairfield forced a tie late in the fourth and briefly went ahead. A back-and-forth final minute ended with a 49-49 score — Eagles sophomore Cheyenne Maddox tied it up with six seconds left. Wild end to regulation, and we’re going to OT. Missoula Loyola and Fairfield are tied at 49-49. Missoula Loyola quickly took the lead in overtime and never let it go, despite more scares from the Eagles. Fairfield junior Kenna Pitcher led all players with 25 points but shot 4-of-28 from the field (14-of-19 on free throws). Senior Makenna Wipf had 12 points and a game-high 13 rebounds, and Maddox added 11 points for the Eagles (14-13). Koppang and fellow junior Sam Clevenger and each scored 14 points for Missoula Loyola (18-6). The Breakers will Forsyth on Saturday morning, hoping to advance to the consolation final at 6 p.m. The No. 2 Wolves kept their season going with a dominant win over the No. 3 Wildcats. Three Forks (14-12) jumped out to an 11-1 lead, but Harlem (19-6) rallied and trailed 15-11 going into the second quarter. The Wolves quickly regained control, outscoring the Wildcats 20-7 in the second quarter, and they continued to pull away in the second half. Three Forks senior Kyle Olson led all players with 33 points, 14 rebounds and four assists. The Carroll College signee shot 9-of-14 from the field, 3-of-5 from 3-point range and 12-of-14 from the free-throw line. Olson also leads all players with 7 rebounds and 4 assists. Kendall Lynn added 11 points for the Wolves, while senior Skylee Dirden and freshman Taya Trottier scored 13 and 12 points, respectively, to lead the Wildcats. The loss ended Harlem’s first state tournament appearance in program history, according to Lawrence. The Wildcats, who fell 40-37 to Forsyth in the first round Thursday, also won a divisional championship for the first time, Lawrence said. Three Forks will play Columbus in another loser-out game. Coverage of the State B boys basketball tournament (Mar. 6-8, 2019) and girls basketball tournament (Mar. 7-9, 2019) from Belgrade. Mar. 7-9, 2019 from Belgrade Special Events Center.